For the genus of moth, see Trachea (moth). For the cup-shaped Byzantine coins, see Trachy (currency). The trachea, colloquially called the windpipe, is a cartilaginous tube that connects the pharynx and larynx to the lungs, allowing the passage of air, and so is present in almost all air-breathing animals with lungs. Only in the lungfish, where the lung is connected to the pharynx and the larynx, is it absent. 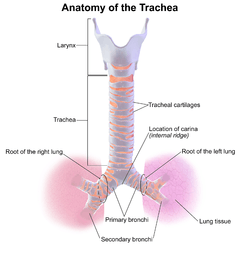 The trachea extends from the larynx and branches into the two primary bronchi. At the top of the trachea the cricoid cartilage attaches it to the larynx. This is the only complete ring, the others being incomplete rings of reinforcing cartilage. The trachealis muscle joins the ends of the rings and these are joined vertically by bands of fibrous connective tissue – the annular ligaments of trachea. The epiglottis closes the opening to the larynx during swallowing. The trachea develops in the second month of development. It is lined with an epithelium that has goblet cells which produce protective mucins. An inflammatory condition, also involving the larynx and bronchi, called croup can result in a barking cough. A tracheotomy is often performed for ventilation in surgical operations where needed. Intubation is also carried out for the same reason by the inserting of a tube into the trachea. From 2008, operations have transplanted a windpipe grown by stem cells, and synthetic windpipes; their success is however doubtful. 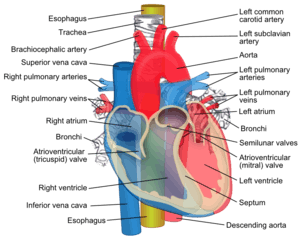 In humans, the trachea passes ventrally to the esophagus, dorsally to the ascending aortic arch, but the left main bronchus from the trachea, passes ventrally to the descending aortic arch. The human trachea has an inner diameter of about 25 millimetres (1 in) and a length of about 10 to 16 centimetres (4 to 6 in). It commences at the lower border of the larynx, level with the sixth cervical vertebra. Inside the trachea at the level of the fifth thoracic vertebra (T5) there is a cartilaginous ridge known as the carina of trachea which runs across from the front to the back of the trachea and marks the point of bifurcation into the right and left primary bronchi. The carina is opposite the sternal angle and can be positioned up to two vertebrae lower or higher, depending on breathing. A ring of hyaline cartilage called the cricoid cartilage forms the inferior wall of the larynx and is attached to the top of the trachea. The cricoid cartilage is the only complete ring of cartilage in the trachea. Below this there are from fifteen to twenty incomplete C-shaped tracheal rings or tracheal cartilages, also of hyaline, that reinforce the front and sides of the trachea to protect and maintain the airway. This leaves a membranous wall at the back, (about a third of the ring's diameter) without cartilage. The cartilages (around 4 mm deep and 1 mm thick) are placed horizontally above each other, separated by narrow intervals. The outer surfaces are directed vertically and the inner surfaces are convex due to the cartilages being thicker in the middle than at the margins.The first tracheal ring is broader than the rest, and often divided at one end; it is connected by the cricotracheal ligament with the lower border of the cricoid cartilage, and is sometimes blended with the next cartilage down. The last cartilage is thick and broad in the middle, due to its lower border being prolonged into a triangular hook-shaped (uncinate) process, which curves downward and backward between the two bronchi. It ends on each side in an imperfect ring, which encloses the commencement of the bronchus. The cartilage above the last is somewhat broader than the others at its center. Two or more of the cartilages often unite, partially or completely, and they are sometimes bifurcated at their extremities. The rings are generally highly elastic but they may calcify with age. 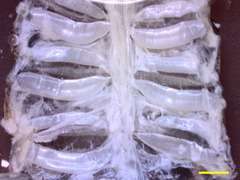 The trachealis muscle connects the ends of the incomplete rings and contracts during coughing, reducing the size of the lumen of the trachea to increase the rate of air flow. The esophagus lies posteriorly to the trachea, adjoining along the tracheoesophageal stripe. Circular horizontal bands of fibrous tissue called the annular ligaments of trachea join the tracheal rings together. The cartilaginous rings are incomplete to allow the trachea to collapse slightly so that food can pass down the esophagus. A flap-like epiglottis closes the opening to the larynx during swallowing to prevent swallowed matter from entering the trachea. In the fourth week of embryogenesis as the respiratory bud grows, the trachea separates from the foregut through the formation of tracheoesophageal ridges which fuse to form the tracheoesophageal septum and this separates the future trachea from the oesophagus and divides the foregut tube into the laryngotracheal tube. Before the end of the fifth week, the trachea begins to develop from the laryngotracheal tube which develops from the laryngotracheal groove. The first part of the cephalic region of the tube forms the larynx, and the next part forms the trachea. The trachea is lined with a layer of pseudostratified columnar epithelium. The epithelium contains goblet cells, which are glandular, modified simple columnar epithelial cells that produce mucins, the main component of mucus. Mucus helps to moisten and protect the airways. 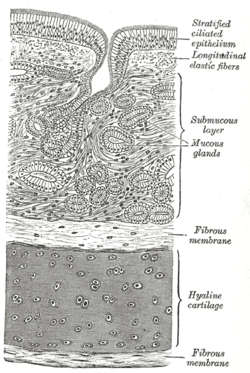 Mucus lines the ciliated cells of the trachea to trap inhaled foreign particles that the cilia then waft upward toward the larynx and then the pharynx where it can be either swallowed into the stomach or expelled as phlegm. This self-clearing mechanism is termed mucociliary clearance. Inflammation of the trachea is known as tracheitis. When the trachea is inflamed as well as the larynx and bronchi, this is known as croup, which often causes a distinct, barking cough. Tracheal intubation refers to the insertion of a tracheal tube down the trachea. This procedure is commonly performed during surgery, in order to ensure a person receives enough oxygen when sedated. The tube inserted down the trachea is connected to a machine that monitors the airflow, oxygenation and several other metrics. This is often one of the responsibilities of an anesthetist during surgery. The epiglottic vallecula is an important anatomical landmark for carrying out this procedure. In an emergency, or when tracheal intubation is deemed impossible, a tracheotomy is often performed to insert a tube for ventilation, usually when needed for particular types of surgery to be carried out so that the airway is kept open for sufficient time. Another less invasive method is used when a procedure can be carried out more quickly, or in an emergency situation, and this is a cricothyrotomy. Tracheal agenesis, is a rare birth defect in which the trachea fails to develop. The defect is usually fatal though sometimes surgical intervention has been successful. A tracheoesophageal fistula is a congenital defect in which the trachea and esophagus are abnormally connected. Sometimes as an anatomical variation one or more of the tracheal rings are completely formed. These O rings are smaller than the normal C-shaped and can cause narrowing of the trachea resulting in breathing difficulties. An operation called a slide tracheoplasty can be performed which opens up the rings and rejoins them as wider rings shortening the length of the trachea. Slide tracheoplasty is said to be the best option in treating tracheal stenosis. Mounier-Kuhn syndrome is a very rare congenital disorder of an abnormally enlarged trachea. A tracheo-oesophageal puncture is a surgically created hole between the trachea and the esophagus in a person who has had a total laryngectomy, (removal of larynx). The purpose of the puncture is to restore a person’s ability to speak after the vocal cords have been removed. A chondrolaryngoplasty commonly called a tracheal shave is the shaving of the cricoid cartilage in order to reduce it to lessen the prominence of the Adam's apple. It is often carried out in transgender surgery. Allowing for variations in the length of the neck, the trachea in other mammals is, in general, similar to that in humans. Generally, it is also similar to the reptilian trachea. In birds, the trachea runs from the pharynx to the syrinx, from which the primary bronchi diverge. Swans have an unusually elongated trachea, part of which is coiled beneath the sternum; this may act as a resonator to amplify sound. In some birds, the tracheal rings are complete, and may even be ossified. In amphibians, the trachea is normally extremely short, and leads directly into the lungs, without clear primary bronchi. A longer trachea is, however, found in some long-necked salamanders, and in caecilians. While there are irregular cartilagenous nodules on the amphibian trachea, these do not form the rings found in amniotes. The only vertebrate to have lungs, but no trachea, is Polypterus, in which the lungs arise directly from the pharynx. The tracheal system branches into progressively smaller tubes, here supplying the crop of the cockroach. Scale bar, 2 mm. The invertebrate trachea refers to the open respiratory system composed of spiracles, tracheae, and tracheoles that terrestrial arthropods have to transport metabolic gases to and from tissues. The distribution of spiracles can vary greatly among the many orders of insects, but in general each segment of the body can have only one pair of spiracles, each of which connects to an atrium and has a relatively large tracheal tube behind it. The tracheae are invaginations of the cuticular exoskeleton that branch (anastomose) throughout the body with diameters from only a few micrometres up to 0.8 mm. The smallest tubes, tracheoles, penetrate cells and serve as sites of diffusion for water, oxygen, and carbon dioxide. Gas may be conducted through the respiratory system by means of active ventilation or passive diffusion. Unlike vertebrates, insects do not generally carry oxygen in their haemolymph. This is one of the factors that may limit their size. Several bioengineering approaches have been tested to repair and replace the trachea. In 2004, the first bioartificial tracheal tissue was applied successfully to close a tracheobronchial defect. In their follow-up of this and further clinical applications the surgeon Thorsten Walles and his co-workers demonstrated a tissue maturation effect following transplantation. In 2008, a Colombian woman, Claudia Castillo (30), received a trachea transplant using her own stem cells so her body would not reject the transplant. In June 2011, a team of surgeons led by now disreputed  Professor Paolo Macchiarini at the Karolinska University Hospital performed the first synthetic windpipe transplant on a 36-year-old Eritrean man, Andemariam Teklesenbet Beyene. The second and the subsequent transplanted patients died from complications within several months to two years after the surgery. Microscopic cross section of human trachea. Larynx helps in the passage of air. Atlas image: rsa3p2 at the University of Michigan Health System - "Larynx and trachea, lateral view"
1 2 "Karolinska Institute has 'lost confidence' in Paolo Macchiarini, says it won't renew his contract". KI. 2016-02-04. Retrieved 2016-02-07. ↑ Ross, Michael. Histology a text and atlas (5th ed.). Wojciech Pawlina. p. 617. ↑ Mescher AL, "Chapter 17. The Respiratory System" (Chapter). Mescher AL: Junqueira's Basic Histology: Text & Atlas, 12e: http://www.accessmedicine.com/content.aspx?aID=6182422. ↑ Antunes, MB; Cohen, NA (February 2007). "Mucociliary clearance--a critical upper airway host defense mechanism and methods of assessment.". Current opinion in allergy and clinical immunology. 7 (1): 5–10. doi:10.1097/aci.0b013e3280114eef. PMID 17218804. ↑ Chiu, T.; Cuevas, D.; Cuevas, L.; Monteiro, C. (1990). "Tracheal agenesis". Southern Medical Journal. 83 (8): 925–930. doi:10.1097/00007611-199008000-00018. PMID 2200137. ↑ Xue, B; Liang, B; Wang, S; Zhu, L; Lu, Z; Xu, Z (January 2015). "One-stage surgical correction of congenital tracheal stenosis complicated with congenital heart disease in infants and young children.". Journal of cardiac surgery. 30 (1): 97–103. doi:10.1111/jocs.12418. PMID 25109422. 1 2 3 4 Romer, Alfred Sherwood; Parsons, Thomas S. (1977). The Vertebrate Body. Philadelphia, PA: Holt-Saunders International. pp. 336–337. ISBN 0-03-910284-X. ↑ Wasserthal, Lutz T. (1998). 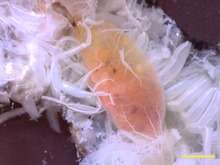 Chapter 25: The Open Hemolymph System of Holometabola and Its Relation to the Tracheal Space. In "Microscopic Anatomy of Invertebrates". Wiley-Liss, Inc. ISBN 0-471-15955-7. ↑ Westneat, Mark W.; Betz, Oliver; Blob, Richard W.; Fezzaa, Kamel; Cooper, James W.; Lee, Wah-Keat (January 2003). "Tracheal Respiration in Insects Visualized with Synchrotron X-ray Imaging". Science. 299 (5606): 558–560. doi:10.1126/science.1078008. PMID 12543973. ↑ Walles T. Tracheobronchial bio-engineering: biotechnology fulfilling unmet medical needs. Adv Drug Deliv Rev. 2011; 63(4-5):367-74. ↑ Macchiarini P, Walles T, Biancosino C, Mertsching H. First human transplantation of a bioengineered airway tissue. J Thorac Cardiovasc Surg. 2004; 128: 638-41. ↑ Walles T, Biancosino C, Zardo P, Macchiarini P, Gottlieb J, Mertsching H. Tissue remodelling in a bioartificial fibromuscular patch following transplantation in a human. Transplantation. 2005; 80: 284-5. ↑ Mertsching H, Schanz J, Steger V, Schandar M, Schenk M, Hansmann J, Dally I, Friedel G, Walles T. Generation and transplantation of an autologous vascularized bioartificial human tissue. Transplantation. 2009; 88: 203-10. ↑ Steinke M, Dally I, Friedel G, Walles H, Walles T. Host-integration of a tissue-engineered airway patch: two-year follow-up in a single patient. Tissue Eng Part A. 2015; 21(3-4): 573-9. ↑ "The top health stories of 2008 - CNN.com". CNN. 2008-12-26. Retrieved 2010-05-27. ↑ "Surgeons carry out first synthetic windpipe transplant". BBC News. 2011-07-07. Retrieved 2011-07-07. ↑ First Successful Transplantation of a Synthetic Tissue Engineered Windpipe. Karolinska University Hospital website, retrieved 8/7/2011.